During the dying days of the Tokugawa Era, the clash between those loyal to the shogun's rule and the insurgent Satsuma Clan threatens to crush all those caught in the middle. 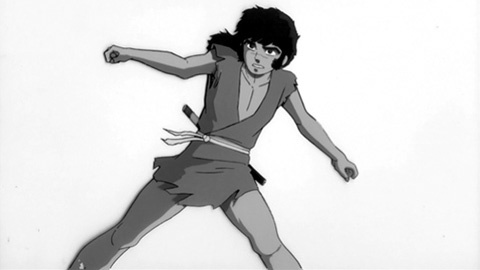 When his adoptive parents are slain by a shadowy group of ninjas, the finger of suspicion immediately points towards Jiro (Sanada), a foundling discovered floating down the river in a basket with nothing more than a note from his real mother and an ornate dagger. 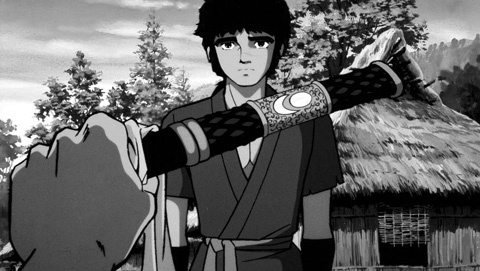 After the young adolescent is hounded from his home at Sai village, he is picked up by the monk Tenkai (Ishida), under whose charge he is trained as a shinobi (ninja). But this early encounter soon turns out to be something of a mixed blessing, when it becomes clear that it did not occur by chance. Following his training, Jiro's quest to trace his lineage takes him first to Ezo (latter-day Hokkaido), where he learns how his real mother, an Ainu named Oyaruru (Ikeda) sent him floating off in a basket following the disappearance of his Japanese father, Taroza (Hazama). A renegade ninja eager to see the end of the shogun's rule due to their systematic oppression of Ezo's indigenous populations, Taroza's legacy to his infant son was the Dagger of Kamui that accompanied him on his arrival in Sai, with kamui meaning "wind of the gods" in Ainu. The blade has the potential to bestow great power on those whose hands it falls into, but its secret currently remains firmly locked within its sheath. The first thing one might note about the debut of Rintaro (Space Galaxy 999, Metropolis) is its length. 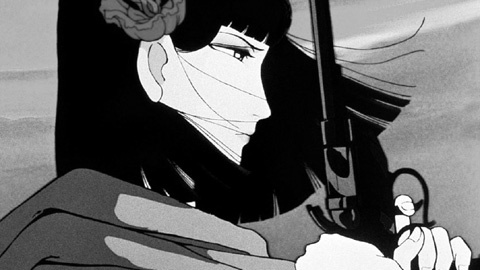 But to be fair, its 132-minute running time comes chock-full with adventure as Jiro embarks on his cross-continental odyssey in search of ancient treasure buried by Captain Kidd, en route picking up a string of multi-ethnic friends and followers including an icily beautiful assassin with a snow-white complexion named Koyuki (whose Louise Brooks-styled bob and general attire is later echoed in Kaizo Hayashi's colourful fantasy Zipang) and an African American slave named Sam, before finding his mirror image in Nevada in the form of Chico, a French girl similarly abandoned at birth and raised by Native Americans whom he saves from the lusty clutches of two rapacious rednecks. There's even a crucial chance encounter with Mark Twain. 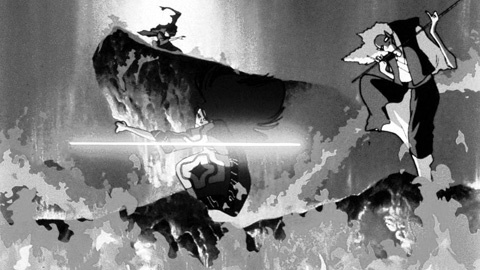 The quality of the animation and character designs are strong, with sword blows rendered as luminous jets of light, long snaking vaporous trails, crimson-hued freeze frames, and showers of leaves serving as expressive devices in the heightened moments of action. Such scale is in keeping with the big-is-better approach favoured by Haruki Kadokawa, the movie mogul whose production company was an offshoot of his father's Kadokawa Shoten publishing empire, which published the Toru Yano novel on which the film is based. But like Kenya Boy, the previous year's foray into this market from Kadokawa (also distributed theatrically by Toei), it perhaps suffers from trying to cram a lot of disparate elements into the meandering plot, with one contrivance too many setting the house of cards toppling towards the end. No doubt some will lament the lack of an English language dub track on the Animeigo DVD release under review. 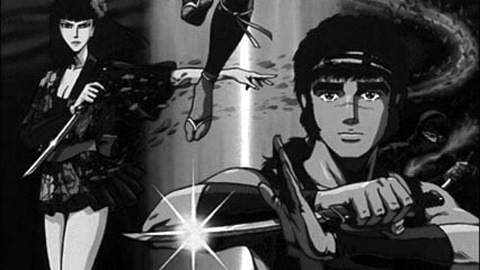 However, it is interesting to note that during the 1980s the film was released under the title Blade of Kamui in a US edit that took pains to divorce the visuals from its historical and cultural context.